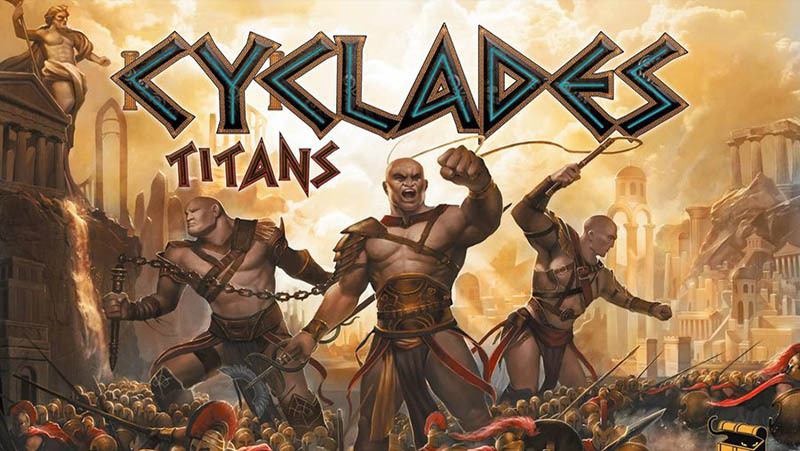 In order to play the Titans expansion, you need to have the Cyclades base game. This expansion offers new modules that are designed to be played together. Of course, you can also add one or more modules from the Hades expansion. However, be warned that you will then be engaged in an Odyssey from which you may not be able to return! From 3 to 5: competitive game. "Everyone for himself" - just like in the base game. The goal is still to have two Metropolises at the end of a cycle. With 4 or 6 players: team-play (with teams of two) - The goal of each team is to have three metropolises at the end of a cycle. With 4 players, one can decide to play either competitive OR in teams. With 6 players, the team-play is mandatory. Unfold the new board on the table. This new board replaces the board from the base game. Use the appropriate side depending on the number of players. From now on, the game takes place on larger islands, divided into territories. 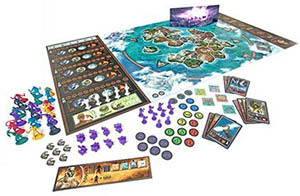 Thus, unlike in the base game, players do not control islands, but different territories that are part of the same island. Territories are therefore equivalent to islands in the base game. They also show spaces for placing buildings as well as prosperity markers that provide revenue. Mythological Creatures whose effects applied to an island in the base game now apply to a territory. Moving troops from one territory to an adjacent territory can be done by using the movement action of Ares (as well as the one from the Titans, as explained later). Note: some of the sea commerce spaces now hold 2 prosperity markers. On this board, before all else, take one of each building types: a Port, a Fortress, a Temple and a University, and place them randomly on each building space (white square) that shows a Building symbol. This way, when the game starts, 4 buildings are already built on the board. A new God, Kronos, joins the Gods from the base game. Players must therefore use the new Offerings board, so as to have enough space for the large God tiles. Shuffle the 5 large God tiles and place them randomly on the 5 empty spaces above Apollo. The last of the 5 Gods will be placed face-down. It will not be available for this cycle. During the following cycle, place this God in the first space, face-up, and shuffle the other 4. Once again, the God placed in 5th place will be face-down and will become the first God during the following cycle. The last 2 Gods will be placed face-down and will become the first two Gods during the next cycle. The last 3 Gods are placed face-down. Two of them will be randomly placed in the first two spaces during the next cycle. 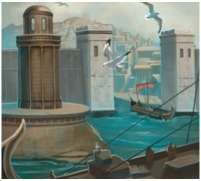 The player gets a free building of his choice among those offered by the Gods located above him on the Offerings board. 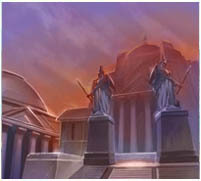 Thus, the closer Kronos is to Apollo, the larger the choice of buildings will be! If Kronos occupies the first place on the Offerings board, the player gets a free Titan instead of a building. The player can spend 2 GP to purchase a Titan. Only one purchase may be made per turn. You can purchase one Titan even if you received one as a free bonus this turn. A player cannot control more than 3 Titans on the board. In a battle, a Titan counts as one troop. It must be placed on a territory belonging to the player, exactly like a troop obtained with Ares. 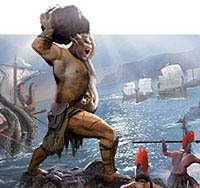 A player who has obtained the favors of Ares can move his Titans like normal troops. However, Titans allow for a new way to move troops, without having to obtain the favors of Ares! Moving a Titan allows you to move any other troops that occupy the same territory. It costs 1GP for the first move. The player can then decide to perform a second Titan move, with the same Titan or with another, for 2GP. A third move would then cost 3GP, and so on. Movement like this allows the army to move from one territory to an adjacent territory or to a territory connected by a chain of fleets of the army's color. When a Titan, alone or moving with normal troops, enters an enemy territory, a battle starts immediately. The Titan counts as one troop. If the owner of the Titan loses one round of combat, he can decide whether to lose a normal troop or his Titan if another troop is part of his army. The Harpy cannot kill a Titan, as it is not a normal troop. A player who chooses Apollo during the offerings phase cannot move his Titans. 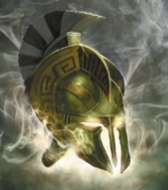 Red did not obtain the favors of Ares. He moves his Titan twice, along with two of his normal troops. That costs him 1GP + 2GP = 3 GP. In the territory he just went through, he leaves one of his territory markers. He then moves another group made of two Titans. This third move costs him 3GP. He places one of his markers on the territory he abandoned. The new board does not come with predefined starting positions like in the base game. The game will therefore start with a first special cycle, like in the Hades expansion. A preliminary round of bidding will now be held to decide on which territories players are going to start the game. The gods tiles are shuffled and placed on the Offerings board. Like in the base game, there must be as many face-up Gods (including Apollo) as there are players. Positioning is done following the auction rule described in the basic rules, with one specific constraint: during the preliminary round, there can be only one player on Apollo. Once the auction is ended, players pay their offerings, as planned. They then chose the territories on which they will start the game, starting with the player who won the auction on the first God, and ending with the one who took Apollo. The player must then deploy his troops on 2 adjacent territories, even if he has 3 troops or a Titan (it is therefore impossible to start the game on one of the smaller islands that are made of only one territory). He must then place his fleets on 2 sea spaces. These spaces must be adjacent to the two territories he occupies, even if he has 3 fleets. If the player received a building, he must then place it in one of his two territories. 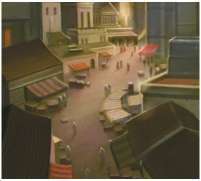 If the player decided to start in one of the territories that already contained a building, then it is possible for him to start the game with two buildings. Once a player has completed his deployment, he places his offering marker on the last available slot determining the order of play for the next round. The player who bet on the next God then deploys in the same fashion. The player who took Apollo will go last and will place a Prosperity token on one of his two territories. Be aware: the first round is a bit different because players receive no income (but only for the first round)! With 6 players, it is MANDATORY that you use the team play rules below. Teammates must start on different islands. With 4 players, you may choose to play in team mode. Players that are part of the same team should sit next to one another, so as to be able to communicate. Players in the same team can share how much gold they have, but cannot give each other GPs! The game is played using the normal rules. Each player controls his own units, nothing is shared between teammates. A player may not cross or enter a teammate's territory (even if it is empty), nor can he use his teammate's fleets. However, teammates will have to collaborate to achieve the new goal: having 3 Metropolises between the two of them. The end of the game is slightly different from the base game: when a team possesses 3 Metropolises, the end of the game is triggered and players finish the current cycle. The game will automatically end, even if that team loses its third Metropolis. At the end of the cycle, the team that possesses the most Metropolises wins the game. In case of a tie, the richest team wins. Like in the base game, it is forbidden to attack a player's last territory, unless it would allow the team to immediately gain the fifth artifact or build its third (or more) Metropolis (see rule below). That territory does not already contain a Metropolis. That territory has the necessary square for a Metropolis (dotted red square). It would give the team its third (or more) Metropolis. Red and his teammate have 2 Metropolises. He conquers Blue's last territory and immediately builds a Metropolis in it. This expansion adds a new element to the game: divine artifacts. 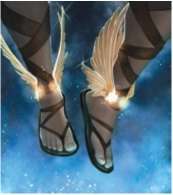 They are represented by cards that are added to the Mythological Creatures deck, and by figurines that will be placed on the board later. At the beginning of the game, the 5 Artifacts cards are shuffled with the Creatures. During the game, these Artifacts will therefore appear on the creatures track. Be careful, these are not creatures! 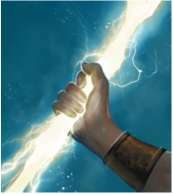 The special power of Zeus does not allow for an Artifact card to be discarded, and temples do not give a discount for buying an Artifact. Moreover, if an Artifact has to be discarded because nobody bought it from the 2GP space, it is not put in the discard pile, but it is put back in the box! An Artifact can be bought like a Creature during a player's turn. When a player buys an Artifact, he keeps the card in front of him as a reminder of its effect and places the corresponding figurine in any one of his territories. Artifacts can be moved along with troops starting in the same territory. The ownership of an Artifact can also change: if a player conquers a territory where Artifacts are present, he gains control of them. The former owner has to give the new owner the corresponding cards. Finally, a new way of winning the game appears: A player or a team owning all five Artifacts at a given time, wins the game immediately! (players do not finish the current cycle). For team-play, the 5 Artifacts can be owned by different teammates. During the revenues phase, this Artifact provides 1 GP. When troops located in the same territory as the Sandals are moving (thanks to Ares or to a Titan), they can go to any territory on the same island, as if they were flying! They act as if every territory of the island were adjacent to their starting territory. The Sandals stay with the troops during this movement. For team-play : the owner can pay 1GP at the beginning of his turn to move the Sandals to one of his teammate's territories anywhere on the board. The Cap can make troops become invisible! Troops travelling with the Cap (thanks to Ares or to a Titan) can use other players' fleets or can pass through territories occupied by troops belonging to other players without needing to stop and battle. The Cap stays with the troops during this movement. For team-play : the owner can pay 1GP at the beginning of his turn to move the Cap to one of his teammate's territory anywhere on the board. Red has gained the favors of Ares and pays 2GP. He uses Black's fleet to cross Greens territory without battle and finally attacks Yellow's territory. Further information: If troops with the Sandals or the Cap have to retreat, they cannot benefit from the power of the Artifact for this retreating move. 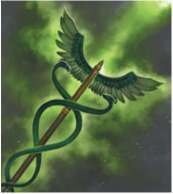 When a battle occurs in the territory where the Caduceus is located, the controlling player can pay 1GP to prevent the destruction of one of his troops. He can use this power as many times as he wants during a turn, as long as he can pay for it. For team-play : the gold piece to save a troop can be paid by the owner's teammate. During the Offerings phase, if the player who owns the Lightning is outbid, the player who outbid him must pay him 1GP. If he cannot pay, he is not allowed to bid on the same God. For team-play : The gold piece that is received by the owner when he is outbid can be given to his teammate. 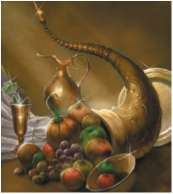 During the revenues phase, every prosperity marker located in the same territory as the Large Cornucopia provides 2GP. For team-play : the GPs provided by that territory can be freely distributed among the teammates. There are 5 Special Metropolis cards in this expansion. At the start of the game, randomly draw two of them and place them face-up on the corresponding spaces in the corners of the board. The other three will not be used during this game. 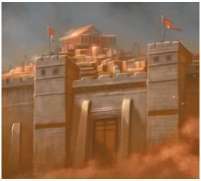 The first player to build a Metropolis can take the card of his choice. He then places in his territory the corresponding tile. This Metropolis has a special power in addition to the normal powers provided by a Metropolis. The second player to build a Metropolis will take the second card and its corresponding tile. Every subsequent Metropolis will not have any special power other than those of a normal Metropolis. Each power is tied to its Metropolis. If that Metropolis is conquered, the new owner will benefit from its powers (the former owner will give him the corresponding card). This Metropolis has a +3 defensive bonus in case of a ground battle, instead of the usual +1. This Metropolis has a +3 total bonus in case of a sea battle on adjacent sea spaces. This bonus can also be used when attacking! 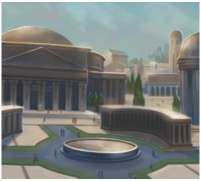 This Metropolis gives a discount of 2GP when buying a Crea- ture, instead of the usual 1GP. It acts as if it held two temples instead of one. The owner of this Metropolis can build new Metropolises by using three Philosophers instead of four. This Metropolis provides 2GP during the revenues phase.